The George V. Weisdack Memorial Scholarship (Weisdack Scholarship) was established in 2011 by James W. Boyd, Chairman of John T. Boyd Company and the Pittsburgh Section of SME (SME Pittsburgh) for promising college students to continue their education in mining engineering, mineral engineering and mineral, ore and coal processing in memory of George V. Weisdack. George Weisdack had a distinguished career as a mining consultant principally in the area of coal mining. He joined John T. Boyd Company in 1980 after coal company employment and was elected vice president in 1989. He worked extensively in the US coal industry focusing primarily on underground mining. However, he also had extensive international experience in Australia, Canada, Chile, China, Mexico, Poland, Russia, Republic of South Africa and Ukraine. George was active in SME Pittsburgh and National SME. He was a Distinguished Member of SME Pittsburgh and was nominated for National Distinguished Member. 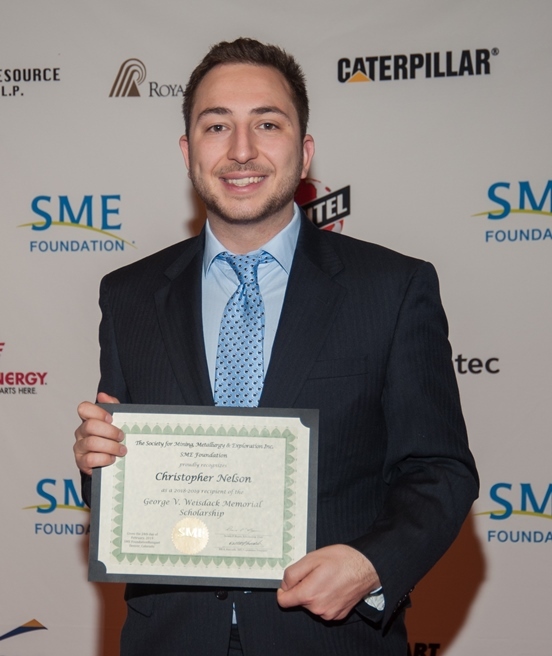 The SME Foundation, in conjunction with the SME Pittsburgh Section, annually awards one scholarship to a promising college student who desires to develop their skills and continue their education in the field of Mining Engineering. This scholarship will be administered by the SME Pittsburgh Section Scholarship Committee with the actual funding coming from an endowment within the SME Foundation. Although preference will be given to a University of Pittsburgh student, candidates from any university will be considered. The total amount of the award is apportioned to one student at the discretion of the Pittsburgh Section Scholarship Committee (up to 5% of the prior 3 year rolling average of the fund balance, or a minimum of $2,000). A Weisdack Memorial Scholarship may be awarded to a student who is a member of SME, attending any college or university of his or her choice that provides the following: a mining engineering or minerals engineering curriculum leading to a B.S., M.S., or PhD. degree. Candidates for awards must be of good character and must have demonstrated scholastic aptitude. College entrance requirements must be completed, class average grades must be maintained overall, and a "B" average is required in the major. Candidates must be enrolled in a regular course of study leading to a degree in mining engineering or mineral engineering. The applicant must also show a proven need for financial assistance to complete the academic program he or she is pursuing. A desire for and probability of success in a career in the mining engineering or minerals engineering field will be important factors in selection of the successful candidate. Before awards are authorized, candidates may be interviewed by one or more of the Scholarship Committee members to determine the nominee's desire for a career his/her chosen field and his/her likelihood for success. Candidates or applicants for this scholarship may be proposed by any of the following: mining and minerals companies; SME Local Sections; state mining institutes; high school principals; manufacturers of mining and processing equipment; minerals research organizations; or mining engineering departments at colleges or universities. Applicant must be a member in good standing with SME. Applicant must be fully matriculated at a school approved by SME (ABET accredited). Junior or senior standing, or above, is also a prerequisite. The applicant must submit two letters of reference from faculty members, people from industry, or others who can write about his/her academic potential and professional interests. Deadline for their letters to be submitted is October 15. The submission deadline for the student’s application is October 15. An interview may be required. The SME Pittsburgh Section will coordinate this, if necessary. Scholarships paid to, or for the benefit of, students at educational institutions to aid in the pursuit of study. Students may be undergraduates or graduates. You use the scholarship money to pay qualified education expenses. Qualifying Expenses Include: Tuition and fees required to enroll; and course-related expenses, such as fees, books, supplies, and equipment required for the course. These items must be required of all students in the course. Non-qualifying Expenses Include: Room and board; Travel; Research; Clerical Help; or Equipment and other expenses that are not required for enrollment. It is the responsibility of the recipient to abide by IRS regulations. For more information, refer to IRS Publication 970.